According to Adam Schefter, the Cleveland Browns and the Cincinnati Bengals attempted but failed to reach a deal to send quarterback A.J. McCarron to the Browns. McCarron has been the Bengals backup since 2014 and while he hasn’t played much, it is worth noting he has played 113 snaps more than fellow quarterback Jimmy Garapollo, who was just traded yesterday for a second-round pick. 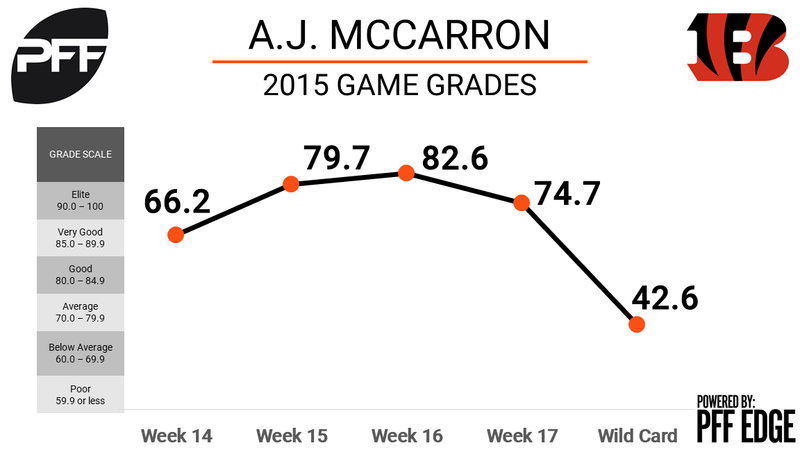 While on the field, McCarron has flashed some ability and in a four-game stretch including a playoff game in 2015, he earned an overall grade of 73.3. A grade that would have been much higher if it wasn’t for a brutal playoff performance in which he earned a game grade of 42.6. Short and intermediate accuracy appeared to be McCarron’s strength during those four games, as ranked second in adjusted completion with a mark of 81.4 percent and also completed 18-23 passes in the 10-19 yard range during that span. The Browns are featuring arguably the worst quarterback room in the NFL this season with Deshone Kizer ranking dead last among quarterbacks in overall grade at 45.3 and Kevin Hogan earning a poor grade of 49.4 in spot duty.